Paleontology, archeology, and art history provide crucial information for the understanding of human evolution throughout ages and its habits. Past animal and plant species are also studied by paleontology and archeology. Paleontology studies traces of life prior to the Holocene Epoch (11 700 BP). Archeology focuses on human activities and evolution from the stone age prehistoric period (3.5 million years BP). Art history studies art objects from their development to their stylistic contexts. In these different fields, proteins are key molecules. In paleontology, protein sequences from fossils of extinct species contribute to reveal evolutionary links. In archeology, bone proteins may offer information for physiological studies. In the case of archeological objects, the identification of proteins constitutive of an object (e.g., textiles), detected on an object surface (e.g., stone tools) or impregnated in an object (e.g., ceramics), reveals human habits from the past and commercial exchanges. In artwork, proteins were widely used as painting binders, as adhesives for gildings, or they were included in mortars and paint grounds. The identification of protein-based material is important information to fully understand the manufacture process ; it informs of the technique used by an artist, and therefore it provides essential information for art historians. It may also support the choice of the most appropriate conservation conditions or restoration procedures. First examinations of artwork materials were described in several treatises dated from the beginning of the twelfth century. Since the 1930s, various methods have been developed to study proteins of Cultural Heritage samples. One of the main difficulties encountered by scientists is to find a satisfying method for chemical analysis, despite the small sample amount available and considering the complex matrix that traps the proteins. In this Review, we intend to show how technical advances in analytical chemistry allowed the emergence of new and more efficient methods for the study of ancient proteins. We chose to build this Review by providing a technical evolution of analytical methods and tools that, while evolving, helped to overcome barriers in the knowledge of studied samples. First, we focus on protein localization techniques and on protein detection methods. 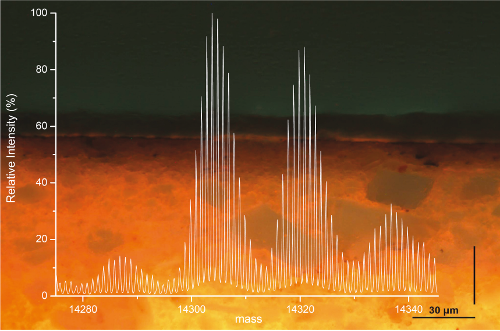 We discuss the stains that were mostly used for the analyses of paintings, fossils, and archeological objects, as well as the newest ones with higher sensitivity such as fluorescent stains derived from proteomics. Another main focus is given to spectroscopic techniques such as infrared and Raman vibrational techniques applied to paleontological, archeological, and art samples. The most recent applications are detailed such as EPR experiments for the study of proteins in their environments. Imaging techniques are also considered as synchrotron-based imaging or TOF-SIMS experiments. In the second part, we describe the most often used methods for protein identification based on amino acid composition (e.g., GC, HPLC coupled or not to MS, Edman sequencing, CZE). We discuss the limitations of these techniques such as the loss of information on biological origins of proteins or their chemical modifications. In the third part, advantages of immunological techniques applied to Cultural Heritage are shown ; in particular, new localization/identification methodologies inspired from biological methods such as ELISA or SERS nanotags are presented. In the last part, we describe proteomic methodologies that allow a complete identification and characterization of proteins. We show how proteomics has recently been applied to a broad range of ancient samples from Renaissance paintings to dinosaur bones. In particular, we explain the two main strategies proposed until now for the identification of proteins, that is, peptide mass fingerprinting and peptide sequencing using tandem mass spectrometry. We show how these strategies are applied to art, archeological, and paleontological samples, and we explain advantages and the power offered by proteomics in comparison with other classical techniques. Limitations and new methodological developments related to specific questions such as the protein biological origin or chemical modifications are presented and discussed. Finally, the newest challenges of proteomics analysis in paleontological, archeological, and artistic samples are presented.